Then this sad sign... no phone number, it is on the lot line between two houses. Of course doing a google on beagie has many dogs with that name... so is this a dog looking for a new owner or is there a dog in jail somewhere? This is the worst case of misspelling BEAGLE since Charlie Brown screwed it up in that spelling bee. Hilarious! Thanks for this blog. 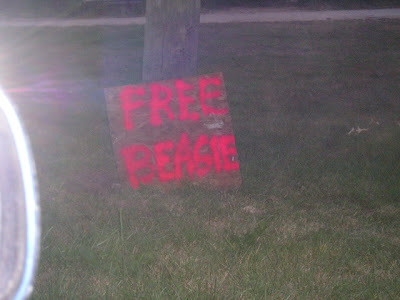 I am going to make "FREE BEAGlE" t-shirts to show my support. their discussion of the sign is EXACTLY what went through my head. word for word. I can't stop laughing - and I need it badly.